No one just snaps. Adults don’t snap; kids don’t snap. The research in the area of threat assessment and violence prevention consistently point to the same key concept: violence is a process, not an event. 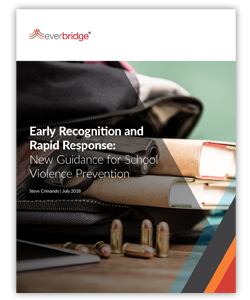 It is highly recommended that leaders and decision-makers in all types of educational settings give equal attention to early detection and prevention, and not focus exclusively on response to an active shooter. Many but not all acts of school violence are preventable. Therefore, schools must be skilled in detecting and deterring threats. The development of an upstander culture, reporting mechanism, threat assessment capabilities, and threat management systems to monitor and keep students of concern moving toward help and away from violence are the essential ingredients. To truly prepare schools for the current threat landscape, it is necessary to balance prevention and response. Having a structured, reliable approach for receiving information about individuals of concern, identifying the level of concern, and developing an effective threat management response are three critical steps in violence prevention. Download your FREE copy today to learn more!